On Wednesday 23rd January, Education and Employers published a new report for Teach First all about career related learning in primary schools. It provides evidence on the benefits of career development activities for children in the primary phase, and the range of teacher roles when delivering it. In doing so the research attempts to map what primary schools are doing to tackle the influence of socio-economic issues that affect children’s future transition to secondary school and beyond, how they approach career-related learning and how we can get a step closer to ensure best practice in primary career provision. The report, written by Dr Elnaz Kashefpakdel, Jordan Rehill and Dr Deirdre Hughes OBE can be viewed here. This report sets out examples of good career-related learning, despite challenges such as finding space and time in the curriculum to provide opportunities to learn about the world of work. The report identifies that an essential ingredient for successful primary schools is buy-in from senior leadership. It recommends that primary schools should develop an approach to career-related learning that enables students to engage progressively in a wide range of experiences of transitions and the world of work. Children should have encounters with the world of work from the age of 5 to see the connection between what they learn and what they might want to do in the future. It is hoped that the conclusions and recommendations from this paper will provide and encourage schools to further engage in career-related learning, help define good policies and practices for schools, and provide ideas for providers of initial teacher education (ITE) and continuous professional development (CPD). The report begins with a review of the international literature relating to career development and career-related learning, examining why this is important in primary schools, what good/interesting policies and practices look like and the role of teachers and leaders in this context. The review outlines what schools should aspire to when providing career-related learning and sets out the existing, albeit limited, evidence on how developing staff roles and responsibilities can help to improve student outcomes. Chapter two of the report presents data collected from 17 primary schools around the UK. In carrying out interviews with Headteachers, Middle leaders and Classroom teachers the report outlines teacher attitudes towards career-related learning (including desired outcomes), the structure of career-related learning (including the taxonomy of roles as well as the activities and programmes provided), and the challenges and solutions associated with providing career-related learning in their schools. Chapter three of the report summarises the main contributions and discussion points gathered from a panel of 25 key experts and thought leaders interested in career-related learning in primary. The findings not only echo and corroborate what was found in the literature and case studies, but they also provide new insights and further details as to the roles that should be recognised in primary, as well as the frameworks and benchmarks used to measure success. In this report we use the term ‘career-related learning’ (CRL) to encompass early childhood activities in primary schools designed to give children from an early age a wide range of experiences of and exposure to education, transitions and the world of work. This is part of a lifelong learning and career development process. Developing knowledge about work. Learn and explore a number of careers, learning pathways and sectors. Developing skills for work and life. Specifically developing non-academic skills such as enterprise skills and social-emotional skills and behaviours that will benefit their own wellbeing and the wellbeing of others. The evidence collected from primary schools reiterated findings from the literature, namely the importance of a whole-school, collaborative approach. Effective careers work should be embedded in the curriculum driven down from senior leadership teams combined with support from curriculum leaders, classroom teachers and partner organisations. The paper also outlined the roles and responsibilities of the senior leader, career-related learning co-ordinator and classroom teacher. All of which are important and often overlapping roles needed when carrying out career-related learning, from the perspective of primary teachers and senior leaders. Five key recommendations are set out below for consideration of Teach First and other allied interested organisations and professionals. Recommendation No 1: The taxonomy of career-related learning roles should be tried and tested in practice by Teach First, as part of an evolving CELP for primary schools in England and Wales. This can also be used by primary schools as a major catalyst for change linked to the ‘Theory of Change’ model outlined in Annex 1 alongside more detailed evidence-based findings. Recommendation No 2: Strong leadership is necessary to support teachers integrating CRL within and outside of the classroom. The senior leadership team should make the relationship between CRL and the aims and ethos of the school explicit, thereby ensuring buy-in from staff and other key stakeholders. Recommendation No 3: In order to achieve a stronger role for teachers in this regard, there is a need to professionalise the area. This should include stronger acknowledgement of CRL in initial teacher education (ITE), the development of a range of levels of CPD, and a rise in the status of CRL and associated leadership within primary schools. Teach First has the opportunity to lead by example. The organisation’s focus offers it a number of opportunities to lead new CRL activity (complementary to the existing post-primary careers and employability leadership programme) through its CPD offer and with its alumni who have left the education system but who are keen to remain connected with it. Recommendation No 4: Primary schools should aim to develop an approach to CRL that articulates how all year groups progressively engage in a wide range of experiences of and exposure to education, transitions and the world of work including links with employers. Teach First is potentially well placed to further develop current practice and diagnosis of need linked to shared and improved understanding of CRL inputs, processes, outcomes and impact measures. Recommendation No 5: New and differing forms of in-service training and CPD are necessary that can support senior leaders and teachers to develop their knowledge and skills in the provision of CRL and the fast-changing world of work. Table 6 in the main report provides some concrete examples. These findings also echo previous work undertaken in primary by Education and Employers Research. 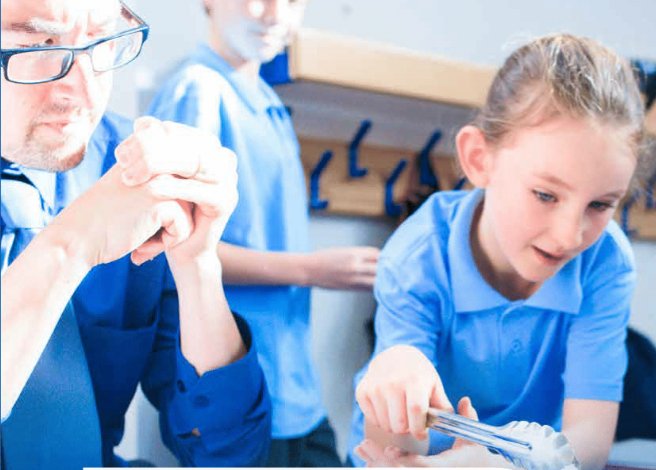 Earlier this year we published a review of research in the past 5 years which highlighted the importance of career-related learning in primary and evidenced why it is crucial to intervene in primary with the aim of raising aspirations and broadening horizons. Teachers tend to agree. Our recent survey, in partnership with Tes and the NAHT headteachers’ union, found that the majority of teachers believe that children should be learning about the world of work and different jobs in their first years of primary school. Nearly half (47 per cent) believed this should start from age five and under and that linking learning to the real world helped increase motivation, broaden aspirations and challenge gender stereotypes.